Bruce Springsteen and the E Street Band have announced a new batch of tour dates, and they’ve posted a rousing live video that serves as a reminder to pick up those tickets, already. 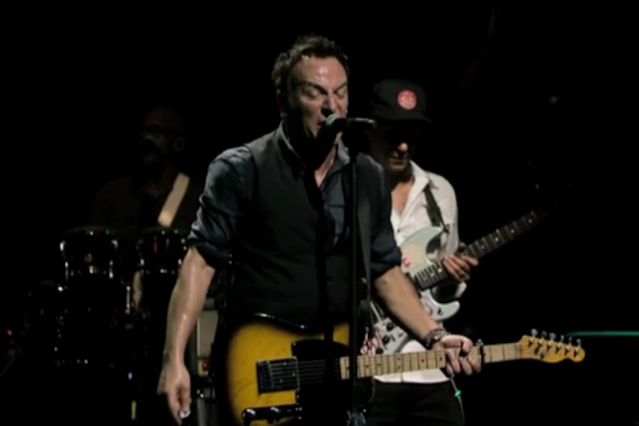 Hey, there’s a reason Springsteen and the E Street Band made our Best of SXSW 2012 list. These guys could be big someday! The video features a gruff, passionate live rendition of politicized stomper “Death to My Hometown,” from the New Jersey legend’s latest album, Wrecking Ball. The E Street band’s performance does away with some of the tin-whistle American Revolution-era affectations of the album version and puts more muscle behind the song’s furiously of-the-moment message: “Send the robber barons straight to hell,” the Boss bellows coldly. The visuals, pulled from shows and rehearsals at New York’s Apollo Theater, in Atlanta, and at SXSW with Rage Against the Machine’s Tom Morello, provide a decent roundup of some of the tour’s momentous moments so far. As for the new tour dates, Springsteen and the E Streeters will be stopping by the Friendly Confines of Chicago’s historic Wrigley Field, and they’ve also added a bunch more stops along the East Coast. Check out the new additions below, and for a full list of concerts, on-sale dates, and ticketing links, visit Springsteen’s website.